Escambia County School District wanted to implement digital learning to help students grasp concepts faster and engage in learning more readily. In order to support that vision, Escambia needed to upgrade their Wi-Fi. 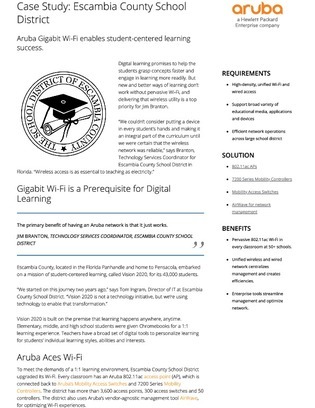 They decided to implement Aruba Networks 802.11ac access points in every classroom, as well as Aruba Mobility Access Switches and Mobility Controllers to optimize Wi-Fi experiences no matter what device it is. Download this case study to learn more about Escambia’s experience upgrading their Wi-Fi.